Bituminous surface treatments (BST) refer to a range of techniques that can be used to create a stand-alone drivable surface on a low volume road, or rehabilitate an existing pavement. 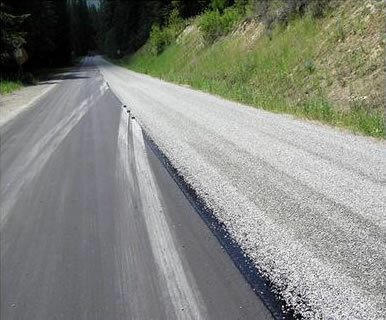 Usually, the term is used to describe a seal coat or chip seal, which is constructed by spraying a layer of emulsified asphalt, and placing a layer of aggregate on top. BSTs can be applied directly to a base course, or on an existing asphalt pavement structure, and represent a low cost alternative to typical asphalt paving. In this RoadReady newsletter, we will focus on chip seals as a rehabilitation option. Chip Seals are appropriate for a number of situations. They can be used as an inexpensive paving option for a low volume road when applied to a base course. On an existing road, they can be used to seal cracks, provide a new wearing course, and provide protection from sunlight and moisture. BSTs also provide a high degree of friction and skid resistance, creating a safe driving surface. Chip seals should only be used to rehabilitate minor distresses on a roadway, such as worn surfaces, raveling, and small cracks. They will likely perform inadequately when cracks become too wide or the pavement has undergone significant structural deformation. Rural roads with low traffic volumes are the best suited for chip seals. In urban settings, additional stresses from turning and acceleration can cause problems before the chip seal has gained sufficient strength. In addition, chip seals tend to generate more roadway noise than traditional asphalt pavements, making them an unpopular choice in populated areas. There is no absolute traffic limit that prohibits the use of chip seals, however virtually all specifications in the U.S. and Canada limit their use to roads with daily traffic less than 20,000 vehicles. Many states also use either 5,000 or 2,000 as a maximum, indicating that there is some uncertainty over the correct suitable range. Selecting the right materials is an important part of constructing a successful chip seal. This includes the emulsified asphalt as well as the aggregate. Emulsified asphalt simply refers to a mix of water and asphalt binder. Because the success of a chip seal depends on the aggregate becoming embedded in the asphalt layer, high viscosity asphalt should always be used. In addition, the setting time must be selected carefully based on weather and traffic control, which will be discussed later. Chip seals are unique from other types of asphalt pavement in that they specify exclusively uniformly graded aggregate, or aggregate within a very small size range. While typical asphalt pavements use densely graded aggregates to reduce air voids, similarly sized aggregates in chip seals allow embedment into the asphalt and interlock between particles. Aggregate size is an important design consideration for chip seals. Large aggregates can be used with higher amounts of emulsified asphalt, and therefore provide a higher degree of crack sealing. However, these increased material quantities are more expensive, and larger aggregate produces more roadway noise. Apart from size, aggregate particles should be angular, not overly slender, and relatively free of clinging fine particles. Before constructing a chip seal, any major deficiencies must be corrected in the existing structure. For example, if alligator cracks are present, subgrade repair may be required. If potholes are present, these must be patched . Next, the surface should be swept to remove particles that could interfere with bonding of the asphalt and the existing pavement. After the asphalt and aggregate have been placed, chip seals are compacted similar to hot mix asphalt pavements. Different kinds of rollers have different advantages and disadvantages for chip seals. Pneumatic rubber tire rollers can provide more uniform compaction on an uneven surface, but tend to pick up individual pieces of aggregate on the tires. Steel wheel rollers on the other hand risk fracturing the aggregate. Pneumatic rubber tire rollers are generally selected over steel wheel rollers for this reason. Following compaction, it is important to keep traffic off of the new surface until moisture content has reached an acceptable level. How long this takes depends on whether the emulsion is slow, medium, or fast setting. Allowing traffic to use the road prematurely can result in the loss of particles from the pavement surface. Bituminous surface treatments represent a low-cost option for the rehabilitation of low-volume roads. Though not ideal for every project, they have become an attractive alternative in a world where thin maintenance and rehabilitation budgets are stretched over large roadway networks. Pavement Design – What’s My Structural Number?